The only reason why I have Monkey Picked Oolong is because I had a Starbucks/Teavana reward to use (let’s not talk about my love for overly sweet but delicious Chai lattes, okay? ), because at $25 for 2oz this is a fairly expensive tea. That said, the dry leaf smells interesting – there’s a very faint floral aroma that mingles with the smell of the tea. It smells a lot like a green tea, which shouldn’t be surprising as it is a green oolong. The only ingredient in this tea is the oolong itself. Teavana spins a nice little story about this tea, of trained monkeys that help with the harvest. From what I read on the internet, this is meant to be one of the highest grades of oolong available. Knowing this rather raises my expectation for the tea because that means it should be really good and it should resteep fairly well (and multiple times). 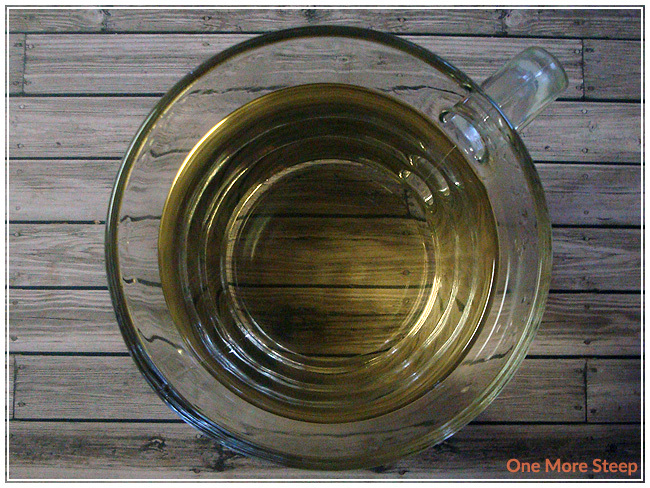 For oolong teas, Teavana recommends steeping in 90°F (195°F) water for 3 minutes. I steeped for closer to 2 minutes. Monkey Picked Oolong steeps to a beautiful golden colour, it’s perfectly clear and it smells amazingly floral. It’s not an overwhelming fragrance though, it’s very light but it smells nice. Taking a sip of Monkey Picked Oolong, I can almost see why it costs so much. It has a taste that is almost sweet, it has some floral notes to the tea with quite a deep vegetal taste to the tea overall. I think it’s quite nice. There are no hints of bitterness, it’s a very pleasant cup of tea. I couldn’t resist steeping the leaves again to see how it would do for one more steep. Monkey Picked Oolong steeps very well for a second round. The colour is still a beautiful golden yellow and it tastes a little bit different. The floral taste is a bit stronger, and there’s a bit of a nutty flavour at the end of each sip that’s new and quite interesting. 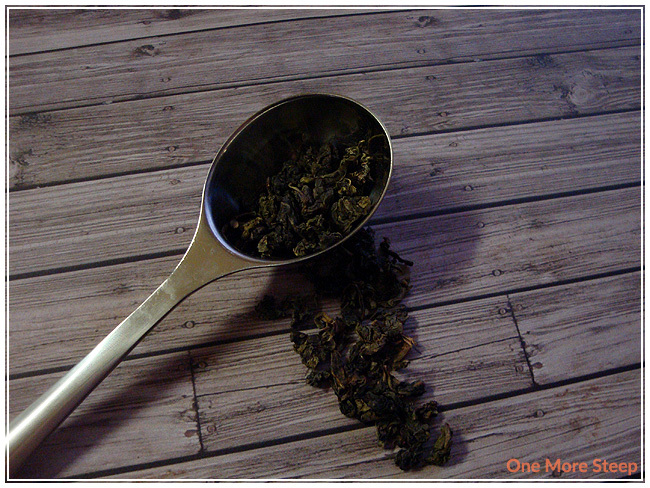 Monkey Picked Oolong did well for steeps 3 and 4, and was a watery afterthought for cup 5. 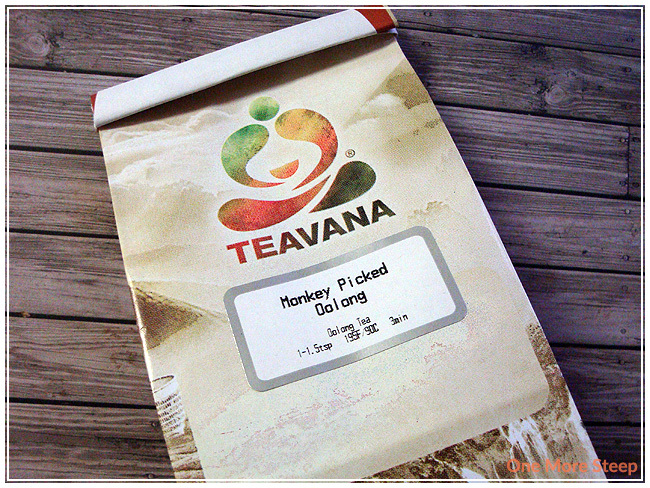 I loved Teavana’s Monkey Picked Oolong. It’s a beautiful colour, beautiful taste, and does fairly well for a few steepings – which takes a bit of the sting out from the high price. While I love it and would love to keep a stock of it in my tea stash forever, I think it’s more of a ‘treating myself’ tea given the high price. I’ll definitely get it again with the free Starbucks/Teavana rewards because that definitely takes the sting out of the price tag! I almost wish I didn’t find it really good, because then I wouldn’t be tempted to get more. If you’re unsure of giving it a try, I would definitely recommend getting it for free if you can or seeing if they’re sampling it in store.